SALT LAKE CITY (AP) — Former GOP presidential nominee Mitt Romney is stumping for fellow Republican candidates as he sails toward a likely victory Tuesday in the race for a U.S. Senate seat in Utah and a return to public office. While he’s largely avoided direct criticism of President Donald Trump since a scathing speech in 2016, Romney has said he would speak out on significant issues. The online essay was published in the final days before an election when Romney is knocking on doors and joining phone banks for local, state and congressional races in his adopted home state. 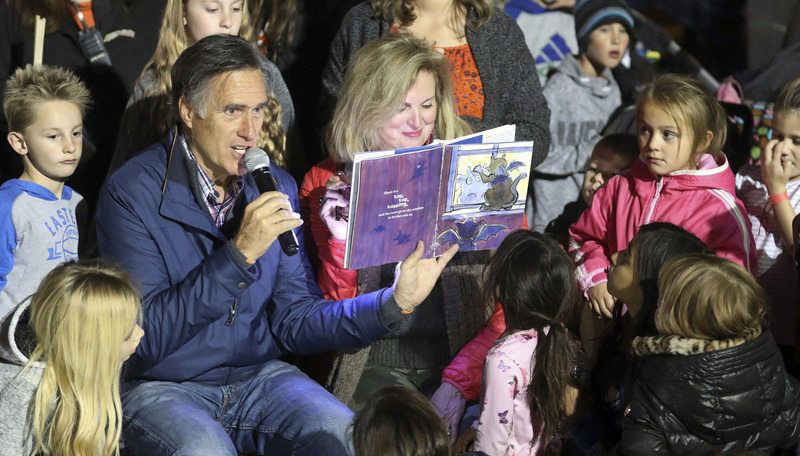 The next evening, he read scary stories to children at a corn maze in Lehi. He and his wife, Ann, sat around a small bonfire with over 100 children and adults. He also judged a pumpkin pie-eating contest at Cornbelly’s Corn Maze and Pumpkin Fest. On a recent stop to Southern Utah, he spoke to students at Dixie High School. Romney has crossed state lines in recent weeks to stump for Republican candidate Martha McSally in Arizona, where she’s locked in a tight race for the Senate seat left open by Jeff Flake’s decision not to run again. Romney has also helped with fundraising for Nevada Sen. Dean Heller’s tight re-election campaign and Florida Gov. Rick Scott’s run for the Senate. Romney’s opponent, Democrat Jenny Wilson, is also working the phones and canvassing for her party’s slate. She has criticized Romney’s Arizona appearance as evidence that he’s more focused on national politics. 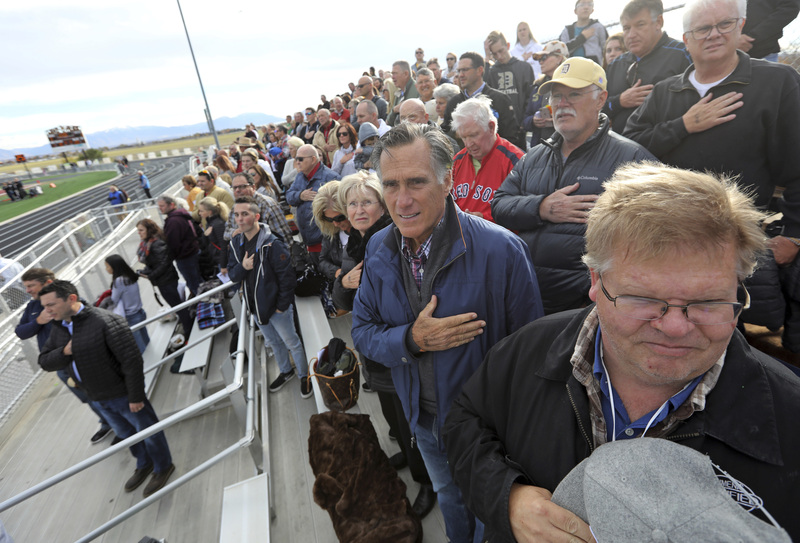 Romney’s camp points to his meetings and campaign appearances with dozens of Utah officials. It’s part of his effort to get out the vote and promote down-ballot candidates, said spokeswoman MJ Henshaw. The two are vying for the Senate seat to replace Orrin Hatch, who is retiring from the Senate after four decades. The outgoing Republican helped convince Romney to run. Romney appears to be a shoo-in for the seat in the conservative state that hasn’t sent a Democrat to the Senate since 1977. Wilson is a member of the Salt Lake County Council and has a political pedigree as the daughter of a former mayor there. Romney is one of the most well-known faces in the state since running as the first Mormon presidential nominee of a major political party in 2012, as well as his work leading the 2002 Winter Olympics in Salt Lake City. He moved to Utah full-time after his presidential loss to Barack Obama. While criticism of Trump has been a political liability for Republicans elsewhere, Romney is able to speak out because many voters are wary of Trump’s bombastic style and comments about women and immigrants. Arguing his high political profile would be a boon to Utah, Romney easily dispatched a rival Republican state lawmaker who forced him into a June primary. He fulfilled a campaign promise to release his tax returns last week, showing he and his wife had a combined gross income of $22.3 million last year. See St. George News’ full election 2018 coverage by clicking here. Romney is a pius, self-righteous, carpetbagger. Are you a Utah native? Does it matter? Is he running for Senate? I think real life answered your question Chris. What’s it matter if he’s from Utah, I’m a member of the church and Romney is not acting like a member, just like Harry Reid. He never had the ability to speak to anybody but Utah. And the only reason he won in Utah is because of his dad and members of the church. Perhaps a showing of some compassion during the election with Obama instead of silence would have gone miles. He needed to speak to everybody and he failed to do so. now you’re going to criticize somebody who has gone the full distance? Romney should understand better than anybody how evil the media is. And guess what Romney Trump is sticking up for us which is more than I can say for you. We get demonized constantly as conservatives. Far as I’m concerned you can stay in Utah. Who are you talking to? Or should I say, ranting to. To me. And I believe EVERY word Bryan said. And your US senator three days. Enjoy. 6 years from now Mitt will be governor of Alaska, then 2 yrs after that he’ll be senator from Wisconsin. Then when he is 98 years old, he will be the President of the Mormon church or what ever it’s called then. Nolan, all these comments about Mitt looks like your student evaluations at DSU. That is correct. I would never support him for dog catcher. Bad mouthing our President, in a make or break election? What a RINO GLOBALIST RAT FINK! Fake News uses “Echo Chambers” as a metaphorical description of a situation in which beliefs are amplified or reinforced by communication and repetition inside a closed system. He thinks that sucking up to the press will make them like him will work. He’s a Republican no matter what he says or does the press will still hate and vilify him. romney is a washed up swamp dweller that could not be elected dog catcher. every time he opens his mouth he sticks his foot in it proving he is a fool. This from the man who lost largely due to the press and Candy Crowly I might also add this is not a free press this is a proactive leftwing press with an agenda to stop republicans nothing free or fair about them. Trump is saying how most Republicans already feel and I at one time supported him. Romney is a loser who should keep his mouth shut. “Republicans ” like him only harm the party. They simply do not understand that Democrat elites are evil, I said and mean evil, people. If you can’t help, just be quiet. Someone please give me an example of Trump attacking the Constitutional guarantee of freedom of the press. Romney has stayed on the national stage to long. He need to run his ranch and look after his children and leave national politics behind. Mitt is an enemy of the people. He is a wolf in sheeps clothing. Mitt Romney needs to learn when to shut his big mouth. Drop the mike on the preck Trump’s President, and he’s not after trying for the seat three times. You can vote for a registered republican running on the Constitutional Party ticket and that’s Tim Aalders. He’s conservative down the line and you can feel good about your vote. We are seeing the consequences of the language of fascism (ie see comments in this thread). Trump started a verbal, illogical war against the press and its gained momentum. Now anyone that challenges his unsupported claims is faced with barage after barage of ad hominem attacks. All the while Trump never has to justify his illiberal and unAmerican rhetoric. Citizens fall in line to do his dirty work. Its not the first time a world leader has done this nor will it be the last. I often disagree with Romney but we need more Republicans taking stands against Trump’s eggregious statements. We need them to put our country’s basic principles ahead of party power. The minority party can’t do it alone (nor are they doing it all that well themselves). The only thing romney is for is himself. People who see things that aren’t there (like fascists around every corner) are suffering from delusional psychosis. Nice try building strawmen. I see fascist language in Trump’s rhetoric, especially in his faux war against the media. There is a reason for that tactic and it has nothing to do with “fake news”. Sounds like the democratic talking points are alive and well with Mitt Romney supporters. Trump didn’t start anything, It was the press who started it with their laughing heads who think they know everything including what the American people think. I am so tired of them sitting in front of the cameras day in and out pretending to know what they are talking about and how “we”feel about it. THEY are not us and THEY should stop talking like they know anything about how we feel or what we think because they don’t. To blame President Trump for all of this is crazy considering the “press” has 24/7 to talk …* and barrels of ink to talk …* about our President; if he responds to them, he’s blames for the whole thing. IT IS all of them. That’s why the MSM has no clue Trump would win by a landslide. They are so out of touch with the average American. The press, be it in print or otherwise, is no longer following journalistic ethics. Trump simply points that out, and he is correct. If you do not recognize this, you are not paying attention. Mitt is out of touch with the times. Time for him to get over himself. Making yourself the self appointed director of the Never Trump Society will not do anything but make you a Jeff Flake look alike. The fact is Trump was elected because he was not a career politician and half of this country was sick of ALL politicians on both sides of the aisle. He has been able to accomplish things Romney and McCain would not of even attempted had they been elected. This Romney goofball is only slightly less liberal than that traitor McCain was. Why doesn’t he just go away and join the Dems? This two-faced, do-nothing will NEVER be President. I voted for Mitts Father twice and was set to vote for him again when he said that he had been Brain-washed. that sent him home. Trump is By Far the best President in my lifetime. Anyone who is against him is against me and this great country. Just leave. Funny, Romney takes time to criticize Trump at a crucial time, but NEVER bothered to criticize Obama when he ran AGAINST him. WHAT party is Romney a member of, anyway? Romney hasn’t got a clue what America thinks. Thanks to John McCain, Romney is the second worst presidential candidate that Republicans ever nominated. There was a time (ever so briefly) that I believed Romney to be a virtuous conservative. Thank God that truth was revealed. Mittens is nothing more than a globalist, cuntry-club RINO who fits in with the pinkest of pinko leftists. Romney needs to just be quiet. He’s supposed to be running to support the President, not replace John McCain as the thorn in the side of progress. As for my opinion? Please, shut up. You lost, he won, get over it. Pam, I think that’s the role Romney will play in the Senate. Like McCain, he will be in the role as the spoiler for Trump’s agenda. I attended 2 Romney rallies when he ran for Prez and then voted for him. Today, I wouldn’t vote for him for dog catcher. He is simply a backstabber! this loser still sore Trump didn’t pick him for SOC well Trump knows He is such a globalist lightweight! I meant Secretary of State! Mitt is a self-serving carpetbagger who is not worthy of the people’s trust or their vote. Why waste a vote on a 3rd party candidate? 3rd partiers pull votes from those of similar poltical persuasion. We need to keep Congrss conservative so our country stays within Constitutionally intended boundaries. MIT may be a questionable Repub, but he’ll likely side with conservative thoughts on bills, etc. That’s why I voted for Mitt for Senate. I’m not particularly fond of him at all, he’s a very polished looking politician, but he is a very weak person, he wasn’t able to hit Obama hard enough to get the Presidency. Thanks for a thoughtful post. We are constantly forced to vote for imperfect candidates. I disagree on some of your assessment but appreciate the honesty. Out of curiosity, what do you mean by hit “Obama hard enough”? As I know the details, the “Obama Republicans” swayed toward his vote because they were tired of that type of politics. Romney organized the Never Trump meeting in Park City. Perhaps a Republican snake is better than a Democrat. But that does not change the fact that Romney is a snake. The Republican Party of Utah picked him. The Church probably played a role i.e. got paid off. I used to live in Utah and know how things work. Off course the Media is the Enemy of the People these days. Who is Romney courting? Is he hoping to be a CNN host or something like that? Put an ankle bracelet on him and track his movements. One never knows what side he is on other than his own. I did not vote for Romney in 2016, since he was and is a very flawed individual. I did vote for Romney in 2012. But, I now compare Trump to the Jaredite king of whom it was said, he did good as far as his people were concerned, but not good for himself, because of his lady friends. (I will vote for Trump in 2020. I may not vote for Romney in 2024). Also, I agree with most of what 42214 said above. Mitt is the penultimate plutocrat (a plutocrat is a rich person who runs for office). And, I agree with what others say above regarding Mitt & McCain. I will vote for Romney Tuesday, though I didn’t vote for him in the prmary, because even this country club Republican (Romney) is better than a Democrat, typically. Yeah, Mitt, that is what the 1st amendment says. However, who says this press is “free”. Given that literally 90% or more of their reporting of Trump is negative. Sure, Trump is a sociopath, but so are Hillary & Bill. And long before Trump was even a presidential candidate, the press at large has largely been so one-sided, it is obvious that this “press” is not ‘free’ (neutral). They are so brainwashed by leftist & liberal college professors before they even are journalists. And I’ve interacted with enough English major leftists, liberals (so-called ‘progressives’), few of them know much about how the real world works. And of those who do, so many of them still lean so far left, they’ve got to be falling over on that one side so much (TIC). Media has long been more against America, free enterprise, etc, because so many believe socialism is superior. (BTW, socialism can only survive as a parasite sucking off of free enterprise. Look at Venezuela. Look at Cuba. Socialism is nothing more (or less) than a government sponsored Ponzi scheme. (What government makes illegal for private entities, it has made legal for itself to do). Mitt, just feather your own media nest and be quiet, K? The guy who threw the 2012 presidential election to OBAMA. Romney, like his father, is no Republican. He is a progressive Democrat infiltrator from Massachusetts. He isn’t a conservative Republican by any stretch of the imagination and now we’re likely to be stuck with him for six years! It is unfortunate for the rest of the Republicans that he dominates the Utah Republican State Committee and has so many admirers sitting on the RNC. He does know how to play the political game. Romney and his political views are now a clear picture of the political views of those who are the rich and powerful of Uah. I can’t imagine the Republican Party of any other state welcoming him as he was welcomed here. Romney’s sanity was questionable during his Presidential Campaign. He is as useful as Maxine Walters, Nancy Pelosi, Wanna Be American Indian, Warren, Booker, etc. Paul Ryan is right behind him. “…Romney took issue with Trump’s characterization of the media as an “enemy of the people…” Romney gets it wrong again. The news media jeopardizes the “cause of freedom” when it habitually supports and protects members of the Democrat party, criticizes Republicans and Conservatives at every turn, and promotes hate and division by inflaming racial and ethnic tensions, while ignoring the many more numerous commonalities that people of different races, and gender have. The news media no longer practices objective journalism where there are no favorites, only fact based reporting. (A) they don’t misquote him. The quotes are accurate in every piece i read. (B) Trump constantly alleges anyone critical of him is “fake news”. He doesn’t use the phrase against creators of fake content on Facebook, etc. He uses it as short hand for “mainstream media” organizations like NYTimes and has for years. Trump is attacking journalist at large and you have to ignore the bulk of his political history to claim otherwise. We have years of campaign rhetoric that exposes the full meaning of his “fake news” and “enemy of the people”. Wrong on both counts. 1) Trump may not agree with his critics, but he respects honest criticism, 2) President Trump has repeatedly clarified his fake news statement “. . . . not all members of the media are the “enemy of the people,” just the “FAKE NEWS, which is a large percentage of the media.” Your reporting that his criticism of the media is a blanket that covers all journalists is FAKE. Question. Since his election as President of the United States what percentage of coverage by the main stream media has been negative? Answer over 90% Now, I suppose you’ll tell me all of this coverage is honest journalism. A) Support your 90% claim with facts. As of now that claim is sn example of “fake news”, ie the true problem that haunts places like social media sites. B). Your own quote supports my conclusions. When he clarifies that his fake news attacks are against “a large percentage of the media” and couple that with his almost five years of attacks its definitely fair to state he is attacking the profession of journalism and media at large. C) Show me were Trump respects critics in general. In contrast, here is a quote from the Art of the Deal: “The way I see it, critics get to say what they want to about my work, so why shouldn’t I be able to say what I want to about theirs?”. And what we have seen is he says absolutely anything about them without regard to scale, truth and especially respect. D) Per journalism…yes, most is honest, classic journalism the founders fought to protect. If anything, we have higher quality journalist than ever before. The problem with the “enemy of the people” and “fake news” attack Trump has deployed (stolen language from horrid individuals like Stalin) is it intentionally ensnares more people than it should. Its designed to be overly broad and used as such. Proof: he and his cronies never truly critique journalist in an articulate and detailed way. He’s not interested in actually correcting journalist when they make mistakes and helping citizens be better educated. It’s fair to conclude from years of evidence he is scapegoating a broad group that has reason to criticize him. Its designed to undermine their criticism and discredit them without providing any proof or evidence. Its authoritarian and inconsistent with our historic values. (For a counterpoint to a potential come back, I called out Obama’s attacks on the free press as well, even though they were minute compared to Trump in hindsight). Yet Romney was silent when the ‘bamsters said that the 48% of Americans whom did not agree with his policies were his enemy and he was going to punish them. Likewise obama said he would reward his cronies [i.e. Solyndra, Goldman-Sach et al]. This is one promise which obama kept. “We’re gonna punish our enemies and we’re gonna reward our friends who stand with us on issues that are important to us,” – barrack hussein obama al Chicago. Actually the Republicans criticized him heavily for that and he retracted/corrected himself. That is how it should work. You make a mistake, listen to the feedback, and change your path. Especially when you deploy inflammatory rhetoric. But Trump double, triples down and fortifies his rhetoric with more bombaste and hate. He employs historically dangerous rhetoric with purpose and abandon. That tall man with low BMI and nice haircut keeps on popping up, as if we need a reminder how to lose. However when a major news outlet (CNN) not only allows one of their well known personalities (Don Lemon) to say things like "The biggest terror threat in this country is white men! ", but also then allows him to justify the statement, then I would have to say that president Trump is correct! The left wing lying liberal lame stream media IS an "enemy of the people"! Except Lemon has facts on his side. He said it too broadly, but statistically white men commit more acts of violent terrorism in the US than any other demographic. Its only a radical comment because the media has led us to believe the ones we should be afraid of are “radical islam” for decades. Its only radical in a country that constantly wants to blame people of color: muslims, mexicans, japanese, etc. But those are convenient distractions from the real problem. President Trump is the most abused President to ever serve our country. The media hates him because their girl lost to him. We have a citizen who won the Presidency and is accomplishing what he promised and the media is exploding from TDS. President Trump is the best President in my lifetime and I will vote for him again. Another typical RINO lie. The President NEVER said the ‘media’ was the enemy pf the people. He said “fake news” was. And is 100% correct. Democracy depends upon an independent press to survive. What we have is 80% of the mainstream news media is a propaganda arm for the Democrat Party. Stalwarts like the Times, Post, and the alphabet networks are not just biased, they are NO LONGER legitimate news sources when it comes to politics. They are prevaricating, slanting, omitting, sleaze merchants who no longer stop to fact check or apologize when wrong (which is quite often). How else do you have 92% negative coverage of one of the greatest starts of ANY Presidency? They avoid anything positive about this President and slant/make up the rest. 65% of all voters now say the news media is most responsible for dividing the country. I think that makes some kind of enemy. If only Romney had criticized a REALLY bad President, Obama, a fraction of what he has Trump. Romney is a bought & paid for Globalist, whose worst nightmare is full employment, rising wages, a defended border, America First, and Trump beating HRC. He, like his political ilk, have betrayed working Americans for global control and profit. Which for supposedly a good Christian is a disgrace. Hopefully the GOP will pick up maybe 5 Senate seats and can either Primary RINOs like Murkowski and Collins, or with Romney, tell him to pound sand. BTW, check your history. Several Presidents used sedition acts to shut down newspapers and even jailed some owners. Including Adams, Lincoln, and Wilson. Were they ‘Nazis’? Trump is just jawboning, but maybe should do more. Trump has successfully inverted the truth. His “fake news” is anything he disagrees with. And do apologists like you start to claim organizations like the New York Times (one of his first targets) is a “propaganda arm” of the DNC. Talk about fake news. “Enemy of the people” wasn’t a random, accidental phrase for his administration. There are smart, historically educated advisors who know its power in fascist regimes. There is a reason tyrants like Stalin deployed it against opposition. It shuts down dialogue and turns supporters into fanatics. Its a phrase that has no place in a democracy. Trump called out fake news Romney, not real news. Romney = Dem media pinata. Remember how they lied about you as a teenager and the binders full of women? Work with Trump, he’s the leader of the party, not you, you idiot. Hey Mitt, Like your campaign for the Presidency you are showing how weak you are. While a Free Press is great. Normally a Free Press is unbiased and not used like a propaganda tool for one certain party. When you have the inability to tell the truth and recognize the problem. You are the problem too. With all undue respect Mitt… Shut Up! The lib media IS a great threat to the American people with their constant disinformation campaigns. It is somewhat perplexing why Romney, supposedly a Republican, would criticize a sitting president of his own party. I believe the answer is that Romney is challenged on the intellectual side, or that Romney is a closet lib. Either way it isn’t hard to see why Romney failed in his bid to become president. Or that he has principles beyond power? This is why Mitt will never win over a National audience. Go away Mitt. Curious…Trump is always VERY careful to say “Fake News” is the Enemy of the People. Romney makes it sound as if Trump is calling all the media the Enemy which means Romney is confirming to all of us that he thinks ALL of the Media is indeed “Fake News”. How about that? Romney is not a conservative. He is the old school, nose in the air, blue blood, country club Repub. His kind are the Never Trumpers who care nothing about anyone but the rich millionaire Repubs. You know, the kind that loved being losers and maintaining the “Status Quo” with the Dims. This guy just doesn’t get it. romey’s dig at Trump is as pathetic as romey running for president “again”. romey will never be president. Exactly why Romney, and for that matter McCain, both lost. Neither was willing to fight back against the liberal news media that has for ever targeted Republicans with outright lies and misrepresented facts. Yet, they give their liberal Democrats the benefits of cover and passes. If they can’t report the whole truth and nothing but the truth regardless of party affiliations then they are the enemy of the people. He is nowhere close to Orin Hatch on the conservative spectrum. Only reason RINO Mitt is ‘sailing to victory’ in Utah is because he’s an O.G. member of the Mormon Mafia. That is the only race I would like to see the Dims win. Because better a real Dim that we can trust to never deviate from the Dim Cult. Than a RINO who who will stab us in the back at the least convenient time. Like McCain did. This is why I don’t support Romney. He’s playing both sides against the middle. Main stream media IS the enemy of the people because they report only things to advance socialist ideas. They are an enemy of the people. I like Trump because he dared to call out the media over its dishonesty and its bias. The media presents the news with a political slant, and will ignore news that refutes their beliefs and cannot be twisted to support their beliefs. They are not there to inform they are there to indoctrinate you to think as they think and to view the world as they do. If you dare think otherwise you are called an extremist crazy person. They try to make you feel as if you are the odd man out and no one else thinks like you. They try to divide the people more and more to the point where people start getting violent with people they do not share beliefs with. They are the enemy, but I have news for media who day in and day out put out propaganda out to divide us. You are out numbered. So Romney thinks fake news, which is what Trump actually called the enemy of the people, is critical to our Republic? Is Romney a Democrat, or just ignorant on his own? I thought Romney would have been a competent president. Much better that the a__hole who beat him. to what is going on all around him. I am so glad to have voted AGAINST Romney every chance I got. Cracks me up reading all of the comments in support of Trump and the media being a propaganda arm of the DNC. Its funny as we know Limbaugh and Hannity are actually stumping for Trump this coming week. Talk about propaganda. Not to mention Trump Jr is dating a former Fox associate. Or that Bannon ran a media site. It just exposes the pure hypocrisy of those comments. Hannity works for a news Network. He’s tried to walk back that reality but he made of living off dispensing of news. He is part of the media. Limmbaugh definitely isn’t a journalist but he’s also made a livelihood dispensing and commenting on news. PS…he claims its not about reporters in general but “fake news media”. So the caveat you made makes no sense. Plus, Hannity and Limbaugh push fake news all the time. Its almost like Trump really doesn’t care about fake news. Mitty continues to be an iconoclastic blowhard. Guess he doesn’t watch Don Lemon on CNN. Per Mr Lemon, Mitt Romney fits the group dynamic and root source of major terrorist events in the US. And let’s get Rachel Maddows opinion. Well Mitt, a free press is one thing, but when 90% of all major media outlets are owned by 4 corporations is it really free? Oh wait, your millionaire, billionaire feiends and constituency owns the other 10%. Forget that one, which Jimmy Carters nephew recorded back in 2011 at one of your fundraisers. I’m writing in Bozo if that is possible. If that is not possible, any other name on the ballot. This man is not a team player and continues to attack the President. He misses Hillary. So you are critiquing media organizations for their wealth? You do realize Trump is the wealthiest president that I’m aware of right? He’s linef his cabinet with self-interest kleptocrats with no interest in the average American. His tax cut? Benefits the upper 5% while most of our benefits will expire after next year. I get criticizing corporate monopolistic control of the media but that is the “free market” and something most conservatives are fine with. Criticizing the President is our country’s DNA. It’s one of the reasons the founders vehemently supported a free press in the Constitution. The point of the press is to call out corruption, especially in our government. Abuse of power was something our founder’s wanted checked at every level. “Haven’t you heard it’s a battle of words, the poster bearer cried” to ripoff Floyd, Haven’t you heard it’s a battle of Billionaires, the plutocrats cried. Yup B&F, Citizens United SCOTUS ruling laid the Democratic process to waste. Choose your billionaire. Youre a fool . At least my billionaire throws a wrench into the deep state. Your billionaire – Sorros? I dont know, wants a global centralized government. No conspiracy here, one world under the United Nations. Think. Don’t have any billionares I support other than shopping. Don’t know Soros other than from the rampant conspiracy theories online. You’ll find I don’t tend to support using money for power. Nothing draws my skepticism more. Agree that Citizens United gutted the few functioning remnants of our representational democracy. But Citizens United was a classically conservative ruling (ie limited government regulation). Didn’t see you as subscriber to deep state conspiracy theories. If you mean civil servants and bureaucrats than I agree he’s throwing every possible monkey wrench in their way. Not sure how that’s a good thing. Trump chose “enemy of the people” for similar reasons he chose “America First”. They are historically loaded terms that get people riled up about boogeymen. He’s using it to divide us and scapegoat others, which is his primary rhetorical tool. He has people salivating about “mainstream media”, “legacy media”, and “fake news” for functional reason other than to maintain a base. He even admits the “fake news media” attack includes the majority of media. His rhetoric embodies the Joseph Goebbels quote: “If you repeat a lie often enough, it becomes the truth.”. Not only do Trump’s apologist take his claims as truth (with no support) but they take on the Herculean task of defending his lies for him. Its a fanatics job. Don’t consider you a fanatic from your other comments. Seems like you are drawing catharsis from his assaults against as someone you see as a common enemy. Sadly that comes with a lot of collateral damage to our country and citizens. Vast majority of journalists aren’t CNN talking heads but he’s made it open season on all of them, literally. He has condoned, explicitly and tacitly, violence against journalist. That’s unAmerican and unpresidential. You seem to have picked the wrong party regarding the lies ,and the Joseph Goebbel’s quote. How about ” You can keep your Doctor” and ” The average family will save $2,500 on their premiums” ! You forget that the social media platforms ban users who don’t agree with their political views. What was one of the first thing Hitler did. He took away the guns from his citizens. So if you are calling Trump a liar, in comparison you are way off base. First president in my life time do actually do what he promised. You knew Obama was lying when his lips were moving. You assume because I call out Trump that I support the DNC. I don’t. Obama definitely lied. But it’s not even close on quality or quantity in a contest between the two. Trump has no loyalty and care for the truth. The Goebbels quote is a perfect match for his “fake news” and “enemy of the people” statements. He says it with no concern about the facts and now his loyal followers are doing the dirty work for him. Thats how the best fascist policies work, not by state enforcement but by citizens taking over the job. It’s divide and conquer. We need citizens to stand up against leaders who trespass on American values and principles without regard to party allegiance. Instead its always dems vs repubs or vis versa depending on who is in power. And now Trump has pushed his party so far into authoritarian terrain that when a classic Republican like Romney does stand up for basic principles Trump’s fanatics attack him for a lack of allegiance. Allegiance to a particular leader is a dangerous path to tyranny; our founders knew that. And this is why Romney is not the President. Because 90%+ of the legacy media are hard-left socialists, they are indeed the enemy of the people. Mr. Romney is a good man. Surely he knows what he and other Republicans are up against. Chuck Schumer leader of the Senate. Nancy Pelosi head of the House. Maxine Waters now in charge of a House Committee with Adam Schiff the same. Sometimes, one has to realize what are the consequences of their words this close to a mid-term election. Yes, Trump has not changed and remains the elephant in the China Shop. He is bombastic but as non-bias sources said………he has not done anything that was harmful. Yes, to some ears but if you think the opposition is fair and goody too shoes, then Mr. Romney is wearing blinders in 2018. Mitt Romney is a rich man who doesn’t want to ruffle the feathers of other rich men. He prefers to get things done behind the scenes and tell people very little. In other words, he’s rich jerk. Always has been. Why do people who claim to be superior to Trump constantly mischaracterize his statements? If you have to lie or misrepresent, your point is not worth considering. Trump has said FAKE NEWS is the enemy of the American people–and it is. Anybody who doesn’t think it is is a beneficiary of its bias and outright lying. The American people deserve a professional, dispassionate press that reports facts so they can make informed decisions. The press we have today meets neither of those descriptions. John you are exactly right, you hit the nail on the head, and your comment makes perfect sense. Thank you! Romney is a Mormon and nominally from Utah but really his best place in life was in Massachusetts where he was about as close to a Republican as the people o f Massachusetts could tolerate, which is to say – not very much. He’s basically a Democrat with one or two impulses that he manipulates to try and convince people he’s going to help them as Conservatives. He’s not going to do that. He prefers endless compromise to conflict. He’ll wait until the media stops yelling at him because he really just can’t stand it. He’s not a very steadfast kind of guy, but he’s rich, because he is a great opportunist. Romney doesn’t even realize he was screwed over during his presidential runs by the same lying, biased, fake news media he’s now defending. Obviously Romney is like the … and liberal media. He can’t understand English. Trump has said it’s the FAKE Media that’s the problem. They distort, report by omission, distort, attack with unfounded allegations, and inuendo. Romney represents the politicians in Washington who are the problem and not the solution. I hope he doesn’t win, and I’ve been a Republican for 55 years. I’m writing in Bozo, if not will choose my vote based on iny meeny miny moe. If it lands on Romney, well, will start again. At least we know Moe is a stooge. Hey, Mitt, you took a dive in 2012, didn’t you? Gave us another four miserable years of Dear Leader, didn’t you? Why not take another one? Might one suggest a dive into the Laurentian Abyssal? You sold us into four more years of Obama. Not that you would have been any different, right? Just think Paul, if his grandstanding on primetime TV during the 2016 election had taken hold and affected the outcome – A President by the name of Hillary Clinton would be in office today, and Saturday Night Live would be off the air due to low ratings. Let’s not forget the Benedict Arnold of the Republican party went directly against the Republican candidate for President in 2016. Where’s deep state former CIA McMuffin these days? Bet he supports Romney. Honestly he hasn’t changed, and his recent remarks prove it. Try winning an election some time, loser, then u can talk. That’s right Luis, got to win BIGLY , LOL and no doubt Mitty will win bigly even though I am voting for Moe of the three stooges. Too bad Huntsman didn’t run. Now there’s a true Utahan who is a class act and has a sense of loyalty. He could, and would have won bigly too Luis. There are times when you win and times when winning is losing. And this is a lose lose situation. J. Huntsman. Served every Presidency since Reagan. Current Ambassador to Russia. Hope he survives his cancer fight. Great person in our era. Yeah, sad, but the Huntsman cancer center will give him a good shot at beating it. Mitt Romney, Glenn Beck, Harry Reid, Jeff Flake and the list goes on and on. The reason why I do not trust mormons. RINOs to the core. Democrats who think they can get elected as Republicans through pretending. mormons are not Christians. They are a cult. Romney? Take a look at all the companies he left DESTROYED in his wake. Everything he touches turns to crap. Romney needs to get lost in a desert somewhere. This is one of the reasons Mr. Spineless was slaughtered—Do damn backbone and surely not a fighter—-LOSER! That’s why Trump won and you didn’t. You were not willing to go the distance. That’s the difference between a winner and loser. Romney does not get it. Trump’s characterized the media as “enemy of the people,” because much of the media is unfair in their reporting. Few people dispute that a free press is important, but their biased reporting is obvious and its embarrassing that Romney does not recognize that. A polite, milk drinking McCain! Just what we don’t need! Trump was wrong when he said the press is the enemy of the American people. It is the enemy of half the American people. I don’t know why he talks about our President Trump. Mitt Romney is listed on the ballot as Republican is he doing a bait and switch?